We did it for the Chooks! : Mega catch-up! 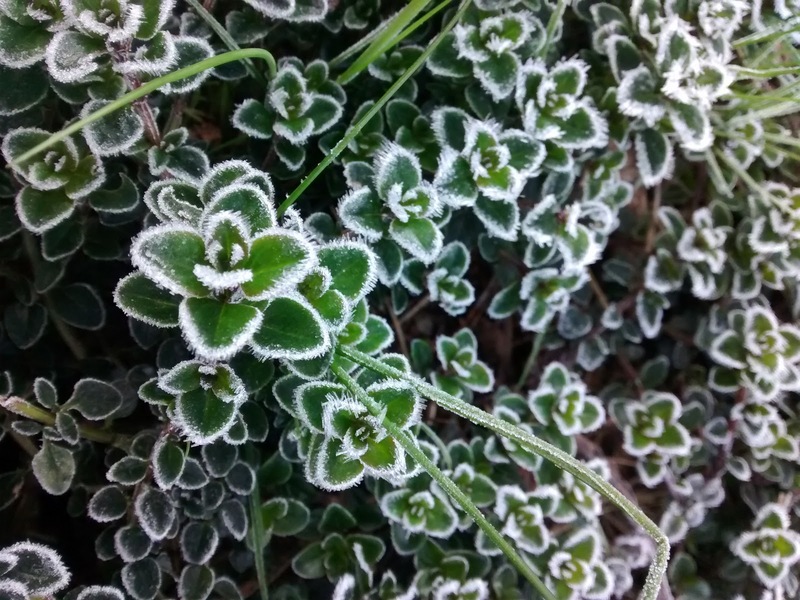 The frost has been a bit harsh this year. 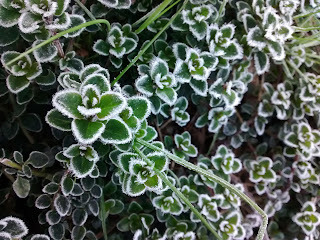 Plants that have otherwise survived many other years suffered this year. It was only a week between there being morning frosts and 30°C (86°F) weather with strong northerly winds. You have to be tough to survive that kind of thing. I mustered up the courage to use the Kubota to dig out some more of the north of the house. It's a little scary doing things like that alone, out where no-one can hear you scream.. ok, it's not space or anything! Using the front end loader on the tractor, I was digging down and managed to get the backhoe stuck on the higher ground and the back wheels of the tractor spinning in the air. That was a little scary! Lifting the backhoe worked, although the pins that held it in place were tight due to the force. Oops. I was really relieved to put it away and be done with it all. Any more adjustments can be made with a shovel! The Kubota is pretty awesome and powerful, and I couldn't have done the job without it, especially with the peppercorn tree roots all over the place. 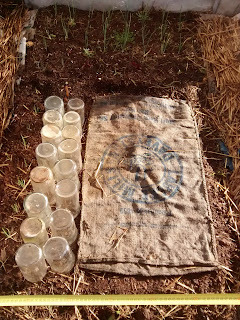 This year I'll be covering the soil with cardboard and straw to help protect the ground from storing the sun's heat. Eventually it'll be an enclosed glass house, but in the meantime it's keeping the water and soil from building up around the house. 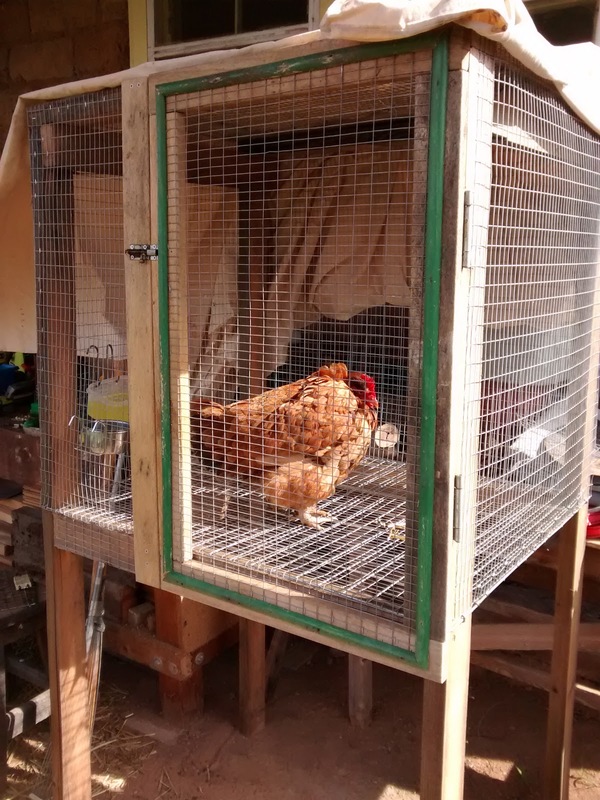 We finally got around to making a cage like the one we had in Stawell. 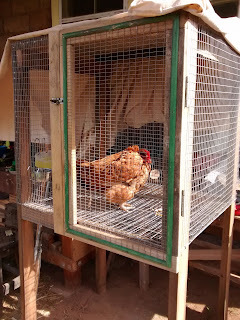 It's super handy for de-brooding chooks, and for caring for sick or injured ones too. Poor old Little Roo was the first to spend time in there. I suspect she was egg bound, and this way we were able to easily administer caster oil and vitamins to her. She perked up for a while, but when it became clear that she wasn't able to pass the egg and she was getting worse again, we put her to sleep. It's like I've heard, the favourites and named birds tend to live the shortest lives. Little Roo was a rare character, and she has place in our hearts and memories. 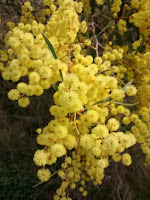 Then all of a sudden everything is blooming and bees are going crazy with all the flowers to choose from. The wattles and the almond trees are always first to bloom, and this year the chaenomeles went crazy too. I have been reading the Square Foot Gardening method, and while I don't exactly have perfect square foot sections in the shadehouse, it still works, and I learned a lot from the book. I have onions at the far end, beetroot next, maybe some garlic down the left side (I found them in a seed tray which was over-run with weeds, the tag too faded to read), I have more beetroot under the fowlers jars which have just popped-up today, and some carrot seeds under the hessian which stays moist with a Wobble-Tee on a timer near-by, and the worms are loving it under there! There's just enough room to get my foot between the beds, but I can reach easily to the middle of the bed. Weeding has been easy so far, but I don't expect my luck to hold out! The running grasses are just waiting for warmer weather. I've got 2 more beds to prepare like this, one for fruits and flowers like tomatoes and cucumber, the other for legumes like beans and maybe some peas too. They've been resting under straw since winter and should be pretty nice by now. The leafy bed has a couple of broccoli plants producing now, and a cabbage starting to get growing, and two silverbeet plants who were planted in slightly the wrong place for the system, and I would have removed them if they weren't so very tasty still. Next year I'll switch it up for crop rotation purposes. It's fairly small, but hopefully productive and manageable too. 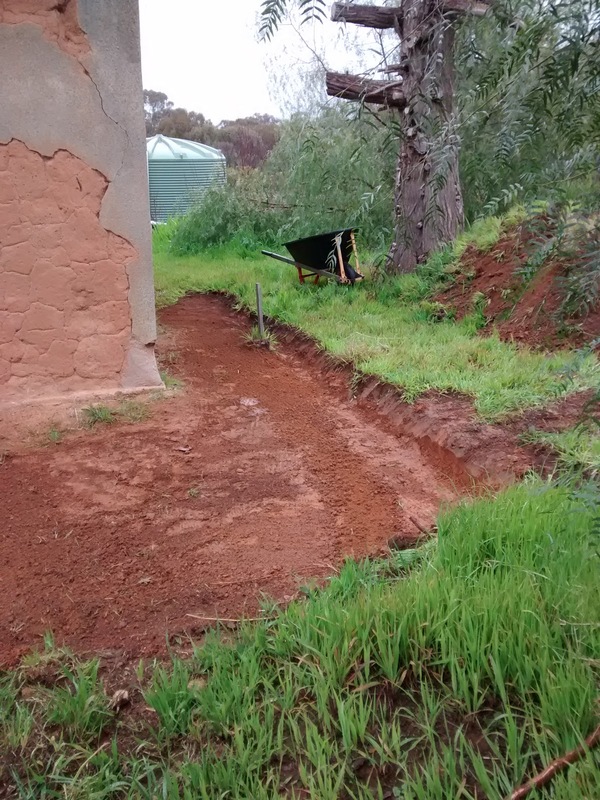 I've been playing with irrigation in the shadehouse. I had trouble finding much information about irrigation with tank water and no pump. I already knew that Wobble-Tee was an option since I've used one before, but all my garden beds are long, not round! 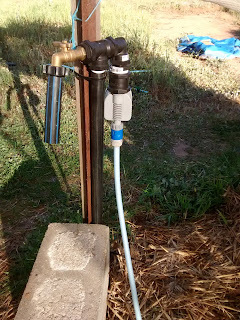 I decided to try a dripper hose and a low pressure garden timer. The dripper hose dribbled water in one spot, slowly dripped in a few others, and did nothing for most of the rest. In order to see if the problem was the garden timer, I plugged in a Wobble-Tee and turned it on. I tried this set-up in the kitchen garden a couple of years back with a normal mechanical timer. The Wobble-Tee didn't work at all, the timer had reduced the little pressure we get down to a dribble. No such issue this time, in fact, it worked amazing because of the slightly lower location to the kitchen garden! So, the timer is a winner, and so is the Wobble-Tee! I've moved the drip line down to the huglebed to see if being lower again might help - but if not, I didn't spend too much money finding out at least. (It will probably be on the Permie "Giving table" soon, I imagine!) I have to run the plumbing down there next, which shouldn't be too hard, then I can test it out. The garden tap has been replaced with a ball-valve tap to maximise the pressure and to make it easier to turn on and off. I love how it's a 1/4 turn to open and close it, especially if I've gotten distracted and the watering can is almost full. That happens more than I care to admit! I'm on tank water too and I've found a couple of things that work well for me when I water. I use a sprinkler that is similar in operation to the Wobble T but really throws a wide spray on little pressure and is IMO better than the Wobble T - it's called the 'Right as Rain' Sprinkler and I get mine from Green Harvest in Maleny by mail order. I've attached a few to the tops of milk crates to get them elevated a bit in the garden beds to throw out over the plants rather than to only get the throw out at ground level. The Wobble T lies abandoned in favour of these light but effective sprinklers and I've now bought a heap of them as I tend to tread on them and break them - my own stupid fault!!! The other thing I use is a micro sprinkler similar to this one https://tinyurl.com/y7wcggyr but it has a 'wall' across the middle of the red coloured bit so that it only sprays half of a circle. The one shown will spray a full circle. Ah! found a pic of the ones I use here http://www.duralirrigation.com.au/product/dan-micro-spray-heads.html I use single sprays on the end of a hose and do sections of long beds over quite a considerable time. I know sprays aren't supposed to be efficient, but I prefer them to drips and so try to spray at the crack of dawn or in the late evening. It works for me and even when my tank gets very low and is due for a top up from the dam. Good luck with the coming summer, I think we are all going to need it given how dry it is already.